Honing his sound amidst Sydney’s bustling creative scene, Patrick James is one of the few who has managed to take his music from the harbour city to the world stage. 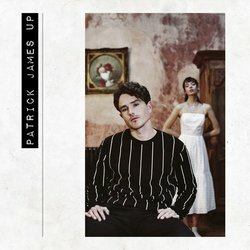 Patrick James was catapulted into the limelight thanks to his debut album Outlier in 2015; a carefully crafted project which effortlessly tangled indie rock, folk and pop flavours. The project’s standout song ‘Bugs’ attained triple j Unearthed rotation and triple j plays, while amassing over 1.3 million streams on Spotify. Refusing to compromise on his relatable musical voice, his forthcoming EP revolves around relationships, filled with humble semi-autobiographical tales detailing mid 20’s life as a whole. Sleek and modern, James is reinventing the typical love song masterfully. Upcoming single ‘UP’ will be the first taste of his EP. A smooth and wholly danceable piano driven anthem, ‘UP’ promises to pluck at heartstrings and redefine his fans appreciation for his artistry as a whole. ‘UP’ is a smooth piano driven anthem about maturity and letting go of the past - all while plucking at heartstrings along the way.